ND900 is the China version CN900 car key copy machine. They perform same functions, different in outlook. (PS: they use different 4D, 46 cloner box when copy 4D/46 chip). So Mini version CN900 is abroad version and mini nd900 is domestic version instead. CN900 mini inherited most of CN900’s feature but mini one make car key copy easier without connecting with 4D, 46, G Decoder Cloner Box. Mini CN900 comes with built-in battery, do not need to attach to the power adapter. CN900 Mini support WiFi, Bluetooth and internet connection. The big size one do not support. - CN900 Mini 1.34.2.19 is confirmed to read diamond keys with EML 10030A chip. - Tested it on a Chevrolet Aveo 2012 - worked in seconds, no decoding. But that was to be expected. They use the easiest transponders. -I still using version 1.13 and cloned few Opel 46 without hassle. -Can clone ALL ID46 chips, i.e clone ID46 for OPEL(Vauxhall)/Peugeot/Citroen. Never failed on id46 to someone. - I have copied about fifty ID46 keys with the CN900 mini successfully. Two times it failed (1x Renault Clio, 1x Opel Movano), because I can't sniff data from ignition. T5, 4C was never a problem. Sometimes it was not able to decode 4D. It starts decoding till 99 and then it stops. I use 4C/4D carbon and different CN chips from Ali. I don't know if original or not. They works all for me fine. Firmware is 1.13 I don't see a reason to upgrade. 1). it reads and copies all 4C easy, 100% works. 2). Mine comes with 4D -decoder, it failed decoding most of the first time, but if you keep trying a couple of times, it will work eventually. the decoding time is about 2~3 minutes. 3). it does NOT copy 46, and will never do without adding external box- 46 Cloner Box, e.g extra money. 4). CN1 and CN2 can be re-used over and over again, big plus when doing 4C eeprom production. you can put them into remote key. For some jobs I’d rather copying than programming. Minor extra cost but safer and quicker, move on to next job quicker. 6). It allows you to edit 4C / ID13 EEPROM data on screen, it helps me doing a lot of hard jobs like Toyota 4C , Honda red key systems..
7). 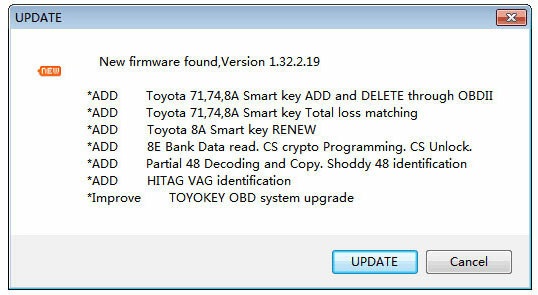 it reads Toyota Smart key data. 8). Touch screen and fast boot-up time in 10 seconds. 9)Meant to beat out the Handy Baby from the market, but as far I see without success. This one is the handheld version of the CN900, as the developers said with all of its abilities. Ok, this info comes from my dealer: the mini knows only 80% of the HB's work tested on real cars. If you have handy baby you don't need the cn. Price is around $190 with free shiping.